Prettily styled first-floor apartment only a few minutes' walk to the beach and the wonderful restaurants and ambiance of the old town of Sainte-Maxime. Open-plan layout and high ceilings, this charming apartment is also close to the Marina. Air conditioning throughout. Three bedrooms, sleeps 6 people. Small dogs accepted. FLEXIBLE START DATES POSSIBLE IN HIGH SEASON. Very light and spacious first-floor apartment located in the Old Town of the charming beachside resort of Sainte-Maxime. It has been elegantly and prettily styled with little touches of Vieille France throughout. 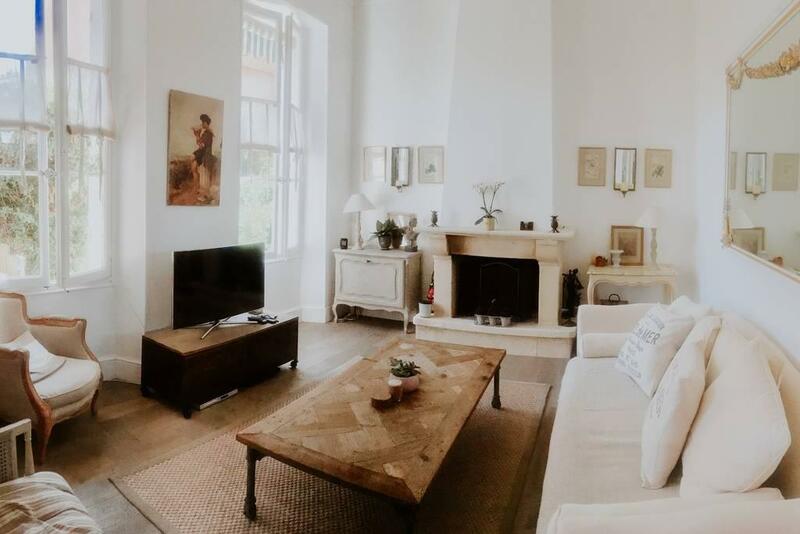 Open-plan layout and high ceilings, this charming apartment is only a few minute’s walk to the beach and the wonderful restaurants and ambiance of the old town. Also close to the Marina. Situated on a quiet street you can enjoy an alfresco meal on the balcony. There is air conditioning throughout but is usually not necessary given the high ceilings and natural ventilation. Furnished to a high standard with many items from Maisons du Monde. Ste Maxime is less glitzy than St Tropez and has a friendly, laid back charm and atmosphere which makes for a wonderfully relaxing holiday. Sainte Maxime is a charming destination for a holiday. It has a bit of everything: great beaches, restaurants, shops, historic buildings in the Old Town and surrounding area. With regular boats across to St Tropez, lots of beaches to choose from close by and an Aqualand, there is plenty to do for a few weeks without even needing a car! There is a great free beach near the tourist office and also some lovely paid beaches near there too, which have restaurants attached. Further along in both directions are plenty of other beaches to choose from, both paid and free. Some of them offer water sports too. You can get pretty much anything within walking distance of the apartment but the apartment has exclusive use of one parking space right outside. If you fancy trying some of the other beaches further along, there are very regular mini buses that run along the beach front and are very inexpensive and save you trying to find a parking spot near the beach. We would recommend taking the Bateau Vert across the bay to St Tropez. They run around every 20 minutes and take about ten minutes to get there. If you drive there it can take 1 1/2 hours to get there in high season and then there’s nowhere to park. We found out the hard way! Market days are Saturdays and Tuesdays in St Tropez. Sainte Maxime is a charming destination for a holiday. It has a bit of everything: great beaches, restaurants, shops, historic buildings in the Old Town and surrounding area. With regular boats across to St Tropez, lots of beaches to choose from close by and an Aqualand, there is plenty to do for a few weeks without even needing a car! the night market, or sit and enjoy a drink and soak up the atmosphere. There's often free entertainment in the evening. FLEXIBLE START DATES POSSIBLE IN HIGH SEASON, USUALLY FINE FOR TEN DAY BOOKINGS. PLEASE ENQUIRE WITH SFHV. End of stay clean 100€. Travel Insurance obligatory to cover for damage to rental property. Access is through the front gates and up the central alley and the private steps to the balcony and apartment. There is exclusive use of one parking space right outside. In addition, there is street parking and free public parking 200m up the road. However, you will hardly need your car as everything is within walking distance. The entire apartment is available with the exception of the fourth bedroom which is used to store the host’s personal items. The space includes the front stairs and balcony and a side entrance and small balcony attached to bedroom two. Anthony & Sarah’s home is located in Sainte-Maxime, Provence-Alpes-Côte d'Azur, France. Sainte Maxime is a charming destination for a holiday. It has a bit of everything: great beaches, restaurants, shops, historic buildings in the Old Town and surrounding area. With regular boats across to St Tropez, lots of beaches to choose from close by and an Aqua land, there is plenty to do for a few weeks without even needing a car! The apartment is very spacious and exactly matches the pictures. With much attention to detail, the apartment has been furnished and there is everything you need for a stay. We felt very well, as it is pleasantly quiet, but only a few meters to the old-town of Sainte-Maxime with its many shops and restaurants. I strongly recommend this accommodation. We had a great time at Apartment Apollinars. Its location is fantastic and in short walking distance from the Centre (100m) and beach (400m). The apartment is nicely decorated and sufficiently spacious for 5-6 people. The apartment meets all requirements in terms of (2) bathrooms, oven, microwave, air conditioners (every room) etc. Overall, we would certainly recommend this place for families that want to visit Sainte-Maxime. This place is a perfect place to stay near both the beaches and nice restaurants. The street is very quit even though it is so close to the center of Saint Maxime. Die Wohnung Apartment Apollinaris tist sehr großzügig geschnitten und entspricht genau den Bildern. Mit viel Liebe zum Detail wurde die Wohnung eingerichtet und es findet sich alles, was man für einen Aufenthalt benötigt. Wir haben uns sehr wohl gefühlt, da es angenehm ruhig ist, aber nur wenige Meter bis in die Altstadt von Sainte-Maxime mit den vielen Einkaufsmöglichkeiten, Restaurants und Geschäften. Ich empfehle diese Unterkunft unbedingt weiter.